I’m Constantin Goldberg and six months ago I joined LSG Sky Chefs in Neu-Isenburg, Germany, as Consultant of the Managing Director at LSG Sky Chefs Lounge GmbH. First of all I want to tell you more about myself. Before I finished my biggest challenge in the past year, the Master of Business Administration CCI (in german: “Staatlich geprüfter Betriebswirt für das Hotel- und Gaststättengewerbe”) at the private SRH Hotel – Akademie in Dresden, I worked in various hotels in Switzerland and Spain… for example as a Concierge and Night Auditor at the 5-star superior Grand Hotel Kronenhof in Pontresina, near St. Moritz in Switzerland. Then I got the opportunity to work for a really interesting and growing company in the LSG Sky Chefs group. As the name suggests, our business is operating lounges. More and more passengers start their business or private journey with a visit to a lounge at the airport. Our daily business is to ensure a perfect service for the airline and its passengers. A place where you feel welcome and well cared for. We all know that the lounge business is not just a small part of the passenger’s travel experience, but a part that leaves an important impression of the airline’s brand and we are really proud to be the host for this part of the brand experience. With more than 750 employees, we operate 48 lounges in three different categories (Business, Senator and First Class) at 12 airports, proving our passion for the wellbeing of about 8.5 million visitors per year. But… we do more than just lounges. We also take care of the ACC Conference Center and the Gate Service at Frankfurt Airport. To make every working day a success, you must have really good staff on the team. Just to give you a short overview of this, I will explain a bit more about the Gate Service team. 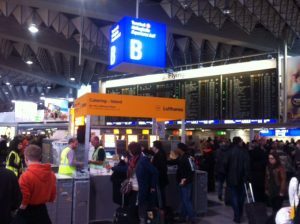 The Gate Service team takes care of the Lufthansa Newspapers and Coffee Stations at the Gates for the Lufthansa passengers. Their daily business is refilling these stations. They are also responsible for the service during IRREG situations at the airport (e.g. weather irregularities or pilot strikes). If you are ever stranded at Frankfurt Airport, you will be thankful for this team. They build catering islands in the middle of the terminals to serve free food and beverages for stranded passengers. In 2014 alone, the team distributed more than 550.000 free products. I really need to say, that I am highly impressed with their dedication and the great work they do. Overall it’s a really interesting and fascinating work place and I’m looking forward to telling you more about it. If you can’t wait and want to know more about the lounge business, just leave a comment. Next time I’ll be telling you about how we approach innovation and quality to be the expert in the lounge business market.